Moose is off to another adventure. Non-LJ Pete & Paula just picked him up today so they can take him on their trip to Africa later this week. They are going to Ethiopia to pick up their new son! This will be continent #5 for Moose. Just Australia and Asia left after this. Writercon was in Minneapolis this weekend, and while I didn't go, I got to meet one of my LJ friends who was in town for it! nwhepcat had twittered to me that she was here and that we should meet sometime this weekend. So after P & P left with Moose I headed on down to the Mpls Radisson. We didn't succeed in finding a coffee shop, so we ended up at Block E in Applebee's. It was actually the same place I sat and chatted with allegraconbrio when she was in Mpls for work and I got to meet her. So now that I've done it twice it is officially a trend. When meeting LJ fanfic friends we will go to Applebee's. Once again I have survived meeting an internet friend and they weren't crazy or a serial killer. Not sure how long that luck will hold out... Luckily I have hellbob to give me advice when I'm going to meet someone. "Don't die. Don't let anyone wear your face." I googled it and it was part of the first major public art undertaking of the Minneapolis Arts Commission in 1984. 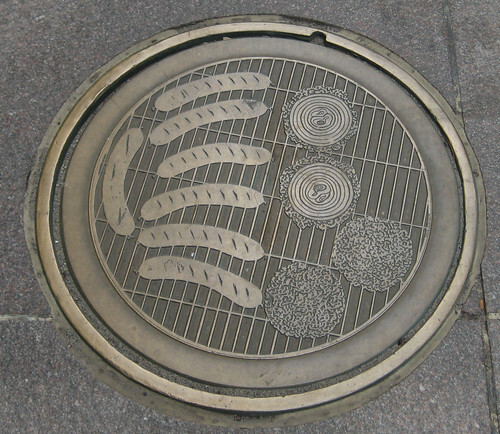 They commissioned 11 artists to design manhole covers, and they're on 6th & 7th Streets between Nicollet and Hennepin. Sometime when Moose is back home I think I need a picture of him on the grill! Well it's better than a real grill! I like the manhole cover! I agree with Rick about meeting strange people. Yay for new travels for Moose! I love your icon. Reminds me of my little guy who passed away. Thank you! She's my sick little kitty right now. I'm enjoying every moment that I get to keep her around. Moose sure does get around...lol. I used to follow someone with Traveling Spike but haven't for a while. I should check to see if she still posts. The manhole cover is awesome! Thanks for sharing. Moose is on Facebook if you want to follow his adventures. If you want to get Moose to Tasmania, you might want to check out the guys at www.coolshite.com They do a movie review podcast, and they had their own little traveller for a while, a Tasmanian Devil. He's scheduled for Australia on September 17th! lucky13charm is taking him with her.